An aviation safety audit checklist help safety managers create new SMS program auditing forms or review their existing forms. These safety audit checklists are from many industry accepted SMS auditing models. Why download these four audit checklists? Serves as an excellent resource for creating best in class SMS programs. Safety audits are critical to the success of every aviation SMS program. They serve to reinforce uniform standards for every aviation safety program. Well drafted safety auditing forms should clearly direct airlines and airports to SMS compliance. 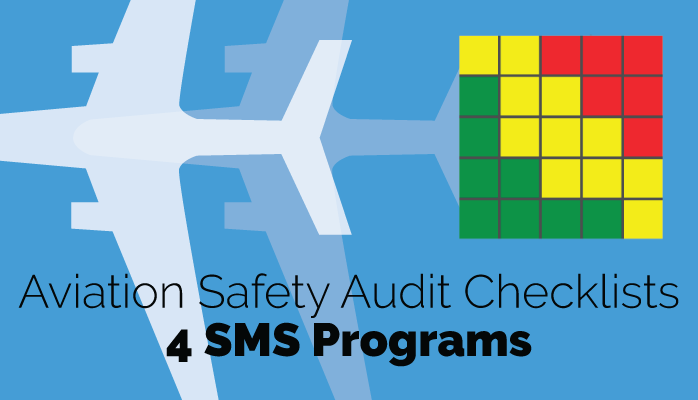 You will have access to four aviation SMS auditing checklist templates.